This club is too much fun!!! 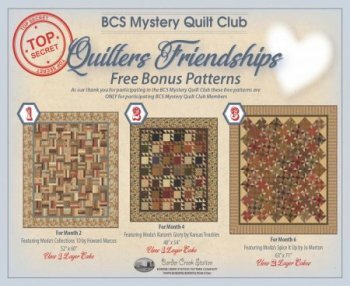 Pick up a piece of your quilt kit every month and complete it.... By the end of the 8 months you will have a gorgeous top ( queen size). It really is a great time watching everything come together to the big reveal at the end! Materials Included: This $30 pays only your registration for the upcoming mystery quilt. Kit/material prices will be separate. Monthly kits will include all fabrics needed to complete the quilt top as well as the binding. Purchasing the entire/complete kit up front will save you $30!